The craft of making cold cuts, also known as charcuterie, was for decades a fringe religion, if not a dead art, in America. In France, charcutiers have plied their trade since the 1400s, and salumi is a cornerstone of Italian cuisine. Only recently has it become a trend among American chefs. 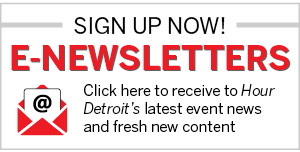 Offal offerings are now de rigueur for some of metro Detroit’s creative menus, with such spots as Detroit’s Angelina Italian Bistro and Novi’s Toasted Oak Grill & Market offering diners daily selections of in-house cured meats. At Forest Grill in Birmingham, chef-owner Brian Polcyn’s charcuterie expertise is evident in the offering of a Charcuterie Assortment Du Jour. Polcyn, who co-wrote Charcuterie: The Craft of Salting, Smoking, and Curing, teaches charcuterie at Schoolcraft College. Metro Detroit’s charcuterie movement seems less a reaction to trends than a reflection of the desire to eat and think locally, while keeping a classic technique alive. At Roast — Detroit’s signature restaurant of celebrity chef and charcuterie die-hard Michael Symon — executive chef Andy Hollyday serves a platter of prepared meats for two. A graduate of The Culinary Institute of America, Hollyday became interested in charcuterie during his school externship at Oliveto, in Oakland, Calif., where he worked for chef Paul Bertolli, “a charcuterie master” who now owns the artisan storefront Fra’ Mani Handcrafted Salumi in Berkeley, Calif. The whole hog isn’t just a figure of speech. Charcuterie developed as a way to preserve proteins (mostly pork) before refrigeration. Today, hams, terrines, and galantines are prepared and devoured simply because they taste good. At Roast, in the Westin Book Cadillac, the rotating options are elaborate. “We make head cheese, lonzino, coppa, ham, pancetta, and bacon, use the skin to cook confit or rillette-style pork, terrines, fresh sausage,” Hollyday says. 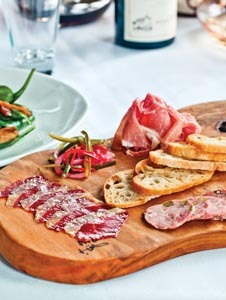 One standout, based on a recipe from his days at Oliveto, is ciccoli, a pork cold-cut confit in the style of a rillette. Hollyday’s recipe is a rustic one, “unctuous and rich,” he says, made from hog trimmings that would otherwise go unused. For Hollyday and his staff, Michigan’s supply of farm-fresh protein is reason enough to make charcuterie. Roast restaurant often gets its hogs from Ann Arbor’s Eat Local Eat Natural, which serves as a middleman between farms and restaurants within a 150-mile radius. The company, owned by Scott Aikens, Bill Taylor, and Tim Redmond, has seen business steadily increase. Aikens partly attributes the upswing to the documentary film Food, Inc., Michael Pollan’s book The Omnivore’s Dilemma, and growing safety concerns about processed foods. If the slow-food movement plays a role in inspiring chefs, so does cultivating and modernizing an age-old craft. Will Branch, 30, and Zack Klein, 31, were born after a time when butcher shops displaying hanging sausages lined streets. But that hasn’t interfered with their plans to open Detroit’s first commercial charcutier, Corridor Sausage, this spring. Morgan & York and Kim’s Produce in Detroit, in addition to such restaurants as Jolly Pumpkin and Woodbridge Pub. Corridor’s meaty métier ranges from traditional breakfast sausages and bratwurst to more esoteric offerings such as Vietnamese chicken sausage flavored with lemongrass, lime leaves, and Thai chiles. The positive reaction Corridor Sausage received from Detroit’s restaurant owners and food lovers spurred their quest to build an artisanal operation within city limits. “There’s available space, and there’s a great food community,” Branch says. There’s even friendly competition, in the form of Porktown Sausage’s Brian Merkel and John Schoeniger, who make all the speck and sausage on the pies at Supino Pizzeria in Eastern Market. If all goes well, Detroit could have two artisan charcutiers open their doors in the next few years. Next articleThe Murray by Adrian’s Church Manufacturing Co.